Keisuke Shimizu: What's the matter? Saeko Kaneshiro: I thought I heard Godzilla just now! Keisuke Shimizu: [scanning the seascape] I don't hear anything. Saeko Kaneshiro: Mm, you're right. But... I could swear that I *did* hear him! One of the Better 70s Godzilla. 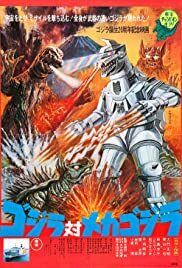 Released in 1974, Gojira tai Mekagojira is a very nice break from the garbage that was 1973's Gojira tai Megaro (Godzilla Against Megalon). Godzilla vs. Mechagodzilla was made to commemorate Godzilla's 20th anniversary. Toho hired veteran composer Masaru Sato for the music, Teruyoshi Nakano was brought back for special effects, and Jun Fukuda returned to direct. After Godzilla vs. Megalon, Fukuda does a 180 and gives us an exciting, original, well-paced film. The special effects are among the best of the Showa series. While some of the Black Hole Aliens scenes leave some to be desired, the monster scenes are well done,and greatly improved over Godzilla vs. Megalon. The battles between Godzilla and Mechagodzilla are fast-paced and brutal. Mechagodzilla is a very original foe for Godzilla, and probably his deadliest. Godzilla himself is the Megarogoji from 1973, but Toho gave him a "mean" look. King Seesar is an interesting monster, and has a small cult following, but many look down upon him due to him getting pummeled by Mechagodzilla. There are flaws though. Character development leaves some to be desired, but this can be forgiven by the film's fast pace. Also, some special effects shots, like Mechagodzilla's chest lightning, look ridiculous. Here's an interesting fact for those who don't already know: During Godzilla's fight with Fake Godzilla, you may notice that Fake Godzilla seems rather goofy, with a chubbier jaw, and his hands resemble Mechagodzilla's missile finger. This is because Toho used a promotional Godzilla suit, instead of making a second Megarogoji suit, which they couldn't afford. The Fake Godzilla suit was also used for water scenes, because water causes a lot of wear and tear on Godzilla suits. Overall, Gojira tai Mekagojira is a fast-paced, fun, exciting film to watch. Possibly the best of the seventy's, and it's leaps and bounds above Godzilla vs. Megalon. However, if you're expecting anything like the original Gojira, or the Golden Age, look elsewhere. But, if you're the kind who enjoys fast-paced action, this is your kind of film.